Today we got a new puppy. He is 10 weeks old. (I am writing this several months later.) 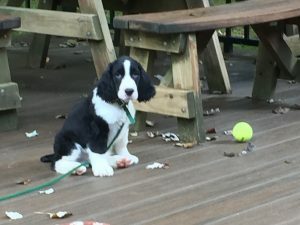 His name is Meriweather Louis, after the intrepid explorer of the American West, and we got him from Cerise English Springer Spaniels in Sherman, CT. Michael had found out about the breeder, and I had visited last March, on my way home from a meditation retreat in Barre. After all the mysterious and unexpected health problems Hugo developed, we wanted to make sure our new family member was healthy and strong from the beginning, so we decided not to get another rescue. We thought we would be getting a liver and white puppy from the July litter, but the waiting list changed and we got a call saying a black and white boy from the June litter was available so we grabbed the opportunity to have our new puppy a few weeks longer before school started. It was a bit challenging to arrange the details of the trip. Michael had fallen off his bike back in July and cracked a rib and smashed his right shoulder. It was the last straw in a long brewing injury, and he needed rotator cuff surgery. By the beginning of September, he was on week-two of six weeks in a sling, couldn’t drive and certainly couldn’t hold a puppy (although he seems to be holding him for a brief moment in the picture above). Luckily, Emily was free to come with us and help. As payment, she also got to roll around in the pen with the 12 six-week-old liver and white puppies we weren’t taking home. Impossibly adorable! I drove the 2 ½ hours there, and Emily drove home while I sat in the back seat with a soft, warm armful of love and cute. Poor Michael was now enduring the third summer of health issues, and another semester on disability. Luckily, Louie provided almost unstoppable laughter and smiles with his always new and entertaining antics and cuteness. 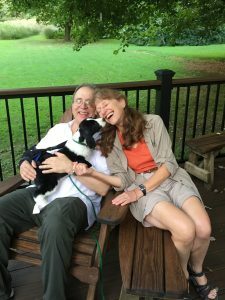 Our hearts were continuously filled with puppy love which helped to chase away the frustration of shoulder dukkha. This entry was posted in Family by Martha Elliott. Bookmark the permalink.